Pr Anyla Bulo, meeting President, organized a prestigious and very successful meeting) in Tirana, capital city of Albania, and the largest city of Albania. Albania is situated in the Balkan peninsula, in south-eastern part of Europe. It land borders are Montenegro, Kosovo, FYR Macedonia to the east and Greece to the south. Albania is a modern and dynamic country which is changing very rapidly. It is washed by the Adriatic and Ionian seas to the west and separated from Italy through the straight of Otranto of 82 km. It was the first time that the BCLF was held in Tirana, symbol of a urban culture preserving Illyrian, Roman, Byzantine culture in a oriental athmosphere between European elements and those typical and Mediterranean' and Balkan' ones. The 13-th BCLF Meeting gathered more than 300 scientist from all Balkan countries and the rest of the world. In this meeting participate lectors from Balkans and European countries like Italy, France, Belgium, Finland, Cyprus, England. Pr Vic Blaton FESCC President, Pr Todor Gruev, BCLF former President gave a enthusiatic welcome address at the opening ceremony. The scientific program was organized in 7 scientific symposiums, two day poster presentations and two workshops, was focused on the diagnostic perspective. The scientific sessions chaired by Stoyan Danev (BG), O Tsolas (GR), K Tzachev (BG),E Refatllari (AL), T Gruev (MK),L Fuga (AL),K Seferadis (GR),M Cojocaru (RO),N Majkic-Singh ( Serbia,Montenegro),A Tzontcheva (BG),O Jankovic (Serbia,Montenegro),T Nurka (AL), S Trajkovska (MK),Y Tudar (TR) contributed to the advance of numerous new and interesting observations, studies, and discoveries in all laboratory medicine branches.A comprehensive exhibition space, dedicated to worldwide and Albanian companies in the field of laboratory medicine as Olympus, Biochem, Fedos, Bio Merieux, BD, Pegasos, DPC, Radim-Seac, Montal, Albos, Novarits. Glaxo, Lek was presented in this meeting.The 13 BCLF meeting offered besides science, an opportunity to meet and discuss our common problems as quality control, continuous education system, laboratory accreditation, and to try to find the best solutions for resolving them. 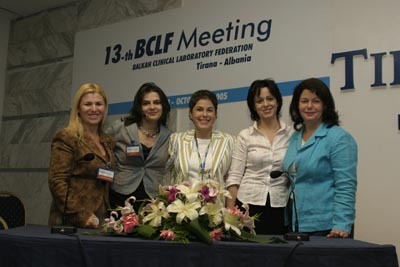 It increased friendship and professional communication to improve the laboratory medicine in the Balkans. During the meeting Prof. Nada Majkic, New President of Balkan Clinical Laboratory Federation. Congartulations Anyla and your staff for the organization, the pleasant memories from gala dinner and from Albania.